If you are more experienced with these occurrences, you may know your early warning signs. You recognise it when you are on edge and at risk of ‘losing it’. But sometimes it’s only once you’ve been fully triggered into fight, flight or freeze mode, that it strikes you that you must do something to help yourself. In any case, what can you do? In the six-minute video I run through three exercises you can learn to use to help manage anxiety and overwhelming emotions. They can be used in a moment of high emotional arousal or when you feel on edge and want to prevent a further build up of stress. First, is a sensory engagement exercise where you turn your attention to your senses, for example noticing the heat of the sun on your back or the weight the bag in your hand, and so on. Second, is a diaphragmatic breathing exercise which requires you to place a hand on your belly ensuring that you feel your hand rise as you inhale and fall as you exhale. Breathe in for a count of three, hold for three, breathe out for three, and wait/do nothing for three. Third, is scanning for tension, where you tune in to your body and find which muscles are tensing, commonly for example in the shoulders and jaw. Scan the whole body, notice tension and release it. I go on to explain that while there is a component of relaxation in the exercises, the primary goal in each is to counter the fight, flight, freeze reaction that has been triggered in your brain and body. By tuning in as the exercises require, you are activating the brain and nervous system in ways that help you switch out of survival mode and back towards a calm state. I suggest you try each and find which suits you best (A Mindfulness exercise is another alternative, see my previous article “The False Promise of Positive Thinking”, the 3 exercises towards the end to try). Use them also as a preventative measure. Practicing them throughout the day will reduce the build up of stress symptoms, and the likelihood of an anxiety attack, a fit of rage or flood of tears. Make it a habit like brushing your teeth, morning and night. Or tie your chosen exercise to another daily incidental activity – do it in transit, while you’re in the lift or waiting to be served (The Beauty of Routine is relevant here). 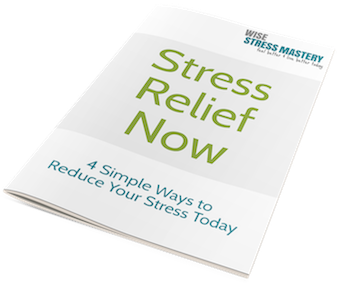 With regular practice, you’ll manage stress better and have ready tools when you need a quick response to panic or strong emotion. Hi Jacqui, just watched your video about the 3 responses to manage stress. Fantastic! I’ve already done 2 out of the 3 exercises and feeling better for it. Hi Cheryl, pleased you’ve given it a go and to good effect! The trick now will be to practice them regularly. Doing so really can have quite a profound effect on how you feel day to day.